This is quite amazing to me. Never heard of these before. The great northern coast of Russia is inside the Arctic Circle, and the shoreline is hundreds of miles from civilisation almost the whole way along. Lighthouses were required for the coast, because it’s a handy passage but it spends a hundred days of the year in near-permanent night. The problems were that they’d be miles from anywhere, and couldn’t realistically be supplied or crewed. 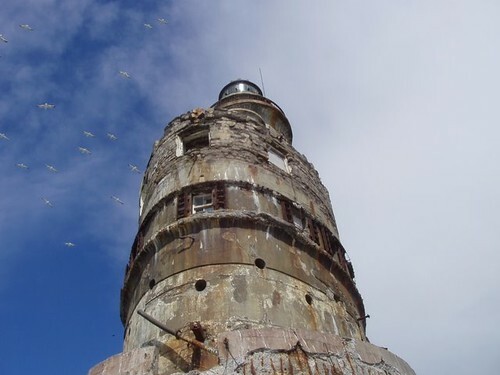 So the Russians erected autonomous nuclear-powered lighthouses. Which worked great, until the collapse of the Soviet Union. In fact, they probably would have been fine after that, if people hadn’t looted them for copper and anything else that looked like it wasn’t nailed down too hard. Including, apparently, reactor shielding. So many of these great polar nuclear lighthouses are now radioactive deadzones. I would tend to doubt that the one in this fantastic series of pictures on EnglishRussia is one of them. But, honestly, you never know, abandoned-site explorers can be a little on the mental side. Anyway. Go and look. wow! truly the stuff of fantasy. if you like a dark, dreary and scary fantasy. love it. 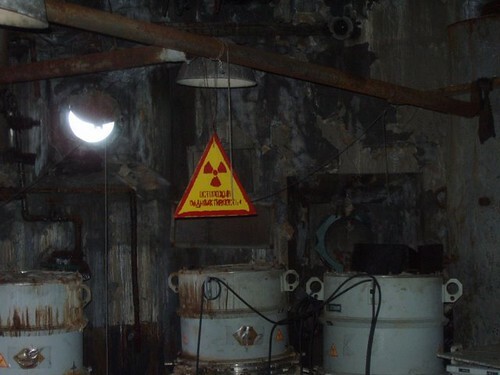 The generators are really cool, especially the photo of the glowing pellet of radioactive death that powers it. Wow! That’s a horror movie waiting to happen. Lucky for us Palin was keeping an eye on those Rooskies. Good ol’ EnglishRussia, that site finds some gems. Somehow it fills me with a strange mixture of awe, laughter and pride. And for some reason, I am still not scared. I think we have a new reality show concept here: Total Makeover: Russian Lighthouse Edition. We’ll get the Kardashian sisters to host. It’s one thing to go traipsing into a radioactive area like that, but I wonder if they were making it a “day at the beach”. The pic of the guy in the lighthouse window is shirtless. I can just imagine the entries in that logbook. Thanks for this heads up. I love stuff like this. Architectural tombstones. This would’ve been a great setting for a Global Frequency epdisode. This would’ve been a great setting for a Global Frequency episode. Who filled out the log books (or whatever they are)? That’s too bad. I hope as Russia goes more free-market that someone with some ambition cleans those up and installs an updated or different system. Something raw-capacitor might be nice. Thanks. I had never heard of Nuclear lighthouses before. I think this does clearly illustrate Russia’s nuclear dillema ,and the lack of security of nuclear facilitys of many knids and those who think it doesnt may need to seriously re-think things ….loose nuclear material of any kind is a very dangerous thing. This is also a reminder to everyone of that. I think it illustrates the point quite well. This cool- Radioactive slime and rust dripping off the sides. Who knew? Chernoble, lost nuclear war heads. They do make some darn good Vodka. Have you ever seen “Cops” Russian episode. They pull over a guy for killing a guy, but its unlawful for the Cop to break the window to get him. So they just keep knocking on the window telling him to get or else. It’s like English Bobies with no guns. How do they stop the Perp. Stop you crook!! or I will say stop again. Ya gotta love this world. Just hang onto the toilet seat long enough so you can get one more good laugh in before you down the drain. I wanna move to Russia a bet the got some cool fireworks. How about a nuclear powered car that can fly, and also be a sumersable, and a snowmobile all in one. That would be cool. USA was working on building nuclear airplanes in the 50s and 60s until Kennedy made the military stop. You can still see the reactors built for them in Idaho near Craters of the Moon National Park. DEW line stations used diesel generators. Military in Alaska is now converting to solar power/batteries to lower the high cost of transporting propane gas to remote radar stations still in use. Those are most-likely radioisotope thermal generators (RTG), not a nuclear reactor. They use thermocouples to generate electricity from the heat put out by the decay of a short-lived nuclear isotope. The radiation they put out is Alpha particles, which can be stopped by a piece of paper. The RTGs in the last picture appear intact, no shielding has been removed. Even if they were disassembled they would be harmless unless the isotope was inhaled or eaten. These RTG’s are also probably more than 30 years old, maybe more than 40, so the isotope is probably past it’s half-life making it not very radioactive anymore. Even brand new, it can’t be used for making explosive weapons. It could only be used for “dirty” bombs, but they would be of very limited effectiveness. The only other practical power source 30-40+ years ago when these stations were commissioned was diesel generators. Over the life of these stations and the RTGs, the RTGs will do far, far less environmental damage than the thousands of gallons of diesel that would have been burned in the diesel generators and in the vessels used to keep them resupplied. These are indeed RTGs however they are not powered by alpha emitters, but rather beta emitted from Strontium 90, and its first decay product Yttrium 90. These are virtually pure beta emitters (a very very weak gamma is associated with these decays but has so little energy as to be safely ignored). Despite its half life of 29 years, Sr90 would still be quite dangerous after 5 half lives i.e. 145 years if not handled properly. With proper safeguards and procedures though it can be handled quite safely. Personally, I think this was a rather clever solution to a difficult logistical supply problem for their remote lighthouses. The failure comes from the post soviet decommissioning and accounting for the materials. I want one, how much to buy one for myself. That lighthouse pictured is actually the Aniva Lighthouse on the south coast of Sakhalin, in the North Pacific less than a hundred miles from Hokkaido. Though it was RTG-powered, it was manned, and not even on the coast of the Russian mainland, let alone in the Arctic Circle. The lack of pictures of the real things anywhere on the internet is possibly because they are truly remote, hundreds of miles from anywhere in some of the most miserable environments on Earth, and several of them have actually been lost – terrible collapse-of-communism record-keeping means nobody actually knows where they are any more.